Do we even need a garage? During the design process, there are elements that get set in stone early in the process. With other elements, it can take a while. With the ProHOME, the major element that moved more than any others was the garage. Let me walk you through the various designs we tried, and why we ended with the garage we did. First of all, we weren’t sure we needed a garage at all. Because this is a rental built essentially “on spec,” and not a custom home for a real family, we developed the design program to appeal to a broad range of readers. In my experience, the vast majority of homeowners either have or would like a garage, usually for vehicles or sometimes just for stuff. I’ve done one-, two- and three-car designs, but two-car is by far the most common. Just like on a more typical custom project, though, we discussed that a garage would add to the cost of the build; the question was whether or not we could justify it. We decided to move forward including a garage but that we wanted to leave the option open of cutting it from the program if necessary due to budget constraints. The first location we considered for the garage was below the house itself. 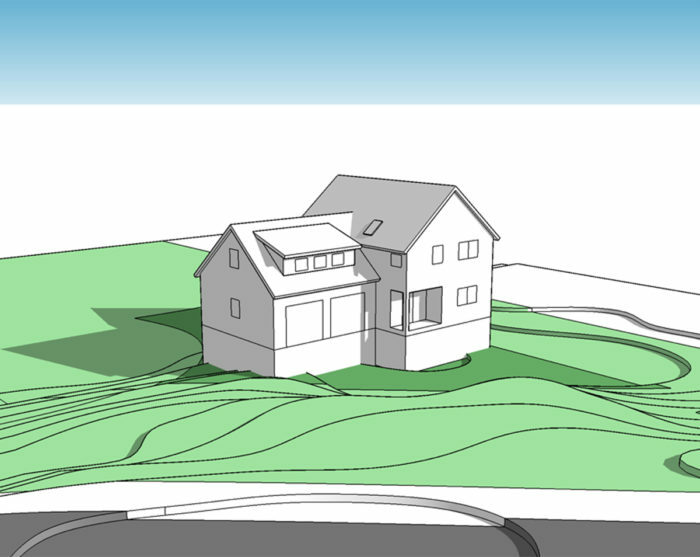 Because the lot slopes, we would have the opportunity for a “daylight basement,” one that is partially buried and partially above grade. The slope of the lot was just gentle enough that we might be able to squeeze a driveway around to the south side, where the lot starts to flatten out. There are other houses in the neighborhood with similar arrangements, and throughout the country for that matter. 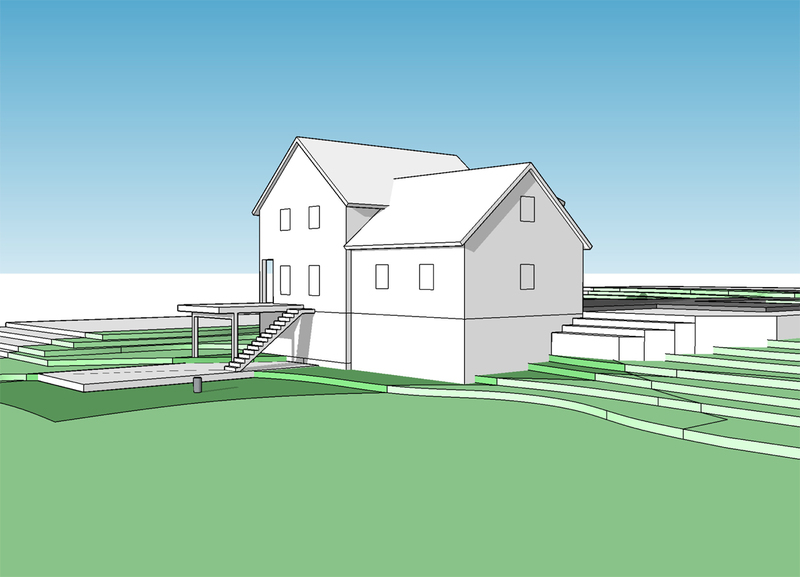 There is certainly an efficiency of space; due to the sloped lot, we would need a full basement for at least part of the foundation anyway; we would save the cost of additional walls and a roof; the buildable envelope was tight and a smaller footprint would allow more options for the house; there was nothing else specifically designated for the basement. The first strike against a basement garage is indoor air quality. With a car running in an enclosed space directly below living space, it is difficult to keep very dangerous exhaust out. Far more than a nuisance, car exhaust is bad stuff, and can be hard to keep out using conventional techniques. In fact, like many air-quality-minded designers, I find the best solution is often a separate, detached garage. 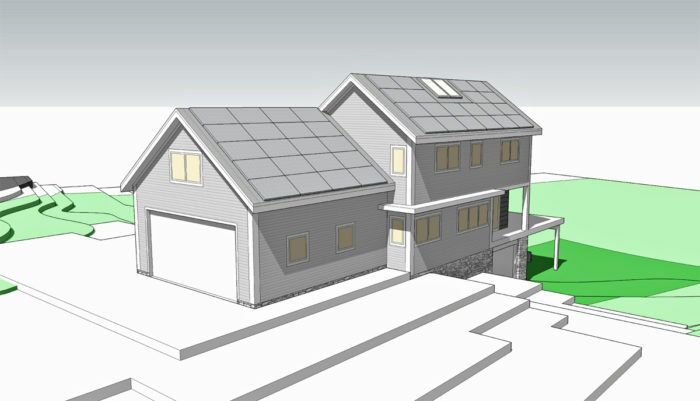 However, I had just been involved in a couple of Passive House projects with garages below living space, and Mike Guertin has successfully implemented the strategy, so I was confident that we could pull it off for the ProHOME. With the idea of showcasing best practices and to create a house that may be replicated, however, we were hesitant that a basement garage was the best approach. The next strike against the basement garage was the idea of an accessible house. Without a specific client in mind, we knew that single-floor living had broad appeal; a basement garage would not be as accessible, or as common, as a garage on the main level. The third strike against the basement garage was the turn-around space that would be required. Driveways are not subject to the building setback, and are typically 12’ to 14’ wide, so ours would fit comfortably between the house and the south lot line, even if the house was pushed tight against the setback. When backing out of a garage, though, anything less than 40’ of clear space for turning around is tight. (Common vehicles range from 15’ to 19’ long). At best we would have 30’ for turning space, but we wanted to keep the option of having some trees along the property line. We could probably get 20’ comfortably, but getting into and out of the garage would be a squeeze. Third strike against the basement garage. The first design concept I presented was a simple shape with a gable facing the street, and a garage to the north of the house. The floor plan had promise and the house would look good and function well. Placing the garage on the north is smart from an energy point of view, we were able to save space with a combined mudroom/entry, and we had good access to a well-lit bonus room over the garage. So far so good. But . . . The first concept I proposed had the garage at the north of the house. A lot of fill would be required. Once backfilled, the garage doors and driveway would feel very close to the entry. The garage would need very tall foundation walls. The garage doors were too close to the main entry. If this had been a tight lot in the city or on the shore, I would have had no issues with the front-facing garage doors right next to the entry. In fact, at the time, I was also working on a more urban renovation where we actually moved the entry closer to the garage doors. On this lot, though, it seemed cramped to have the entry right off the driveway, with the porch post (which also would have supported the second floor and roof) vulnerable to errant drivers. Perhaps if the main floor of the house could have been at least a couple of feet higher than the garage, it would have worked, but to keep the design accessible and the floors at the same height, the entry would feel too close to the driveway. 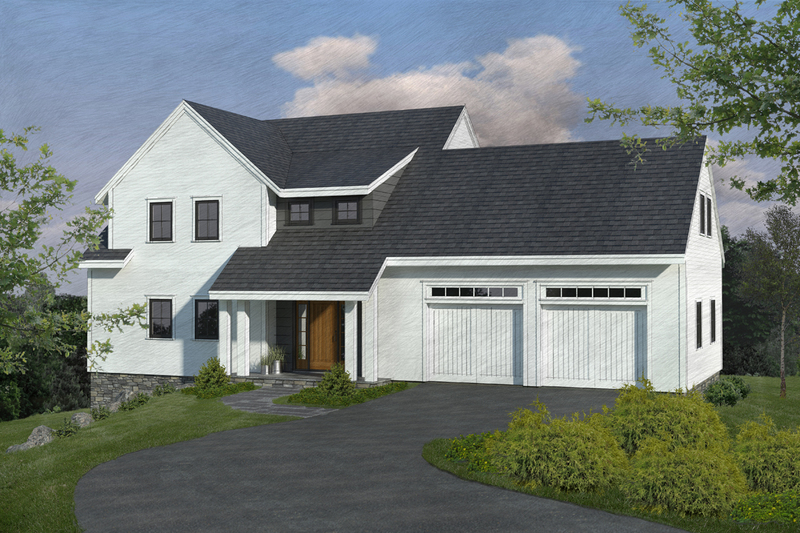 Additionally, aesthetically, the large garage doors would tend to dominate the look of the front of the house. Strike one. The sloping lot would require tall foundation walls. The least expensive garage foundation is a floating slab, but that is not allowed by code to be attached to a house without using a big pile of rigid foam below and around the concrete. Frost walls are the common solution in cold locations, but they would not work for us at the normal height because of the drop in grade. We would need walls at least ten and possibly up to 14’ high! That’s a very expensive way to build a garage. Once the walls were poured, we could either backfill the interior, or use precast concrete panels to create a garage floor. Either way seemed like a lot of dollar signs for what was supposed to be a simple garage. Strike two. The garage was not designed in isolation, of course; we were designing and discussing the rest of the house at the same time. The floor plan that went with the garage-on-the-north scheme was efficient and had some good features, but it was lacking in some ways as well—the big ones being no flex room on the main level and no laundry room on the second floor. We also decided that the master bathroom and closet needed to be a little bigger. To accommodate these changes while keeping the basic layout, we needed more space in the north-south direction, which simply did not leave space to include a two-car garage. 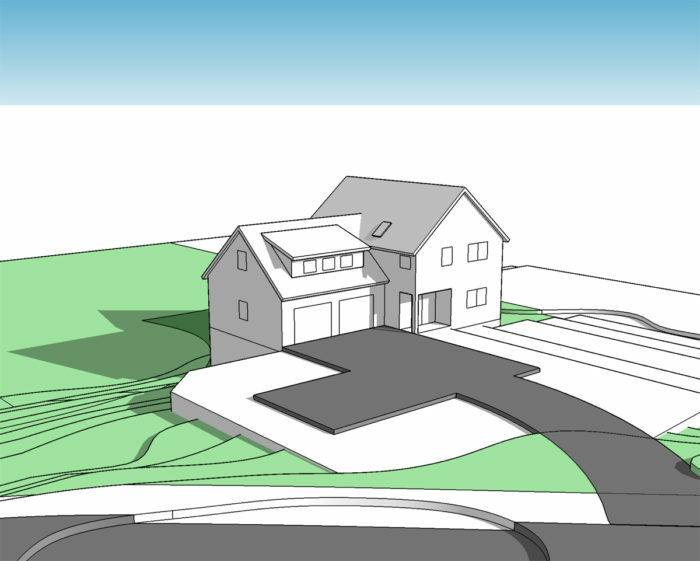 As we honed the house plan and overall look, the garage migrated to the west. 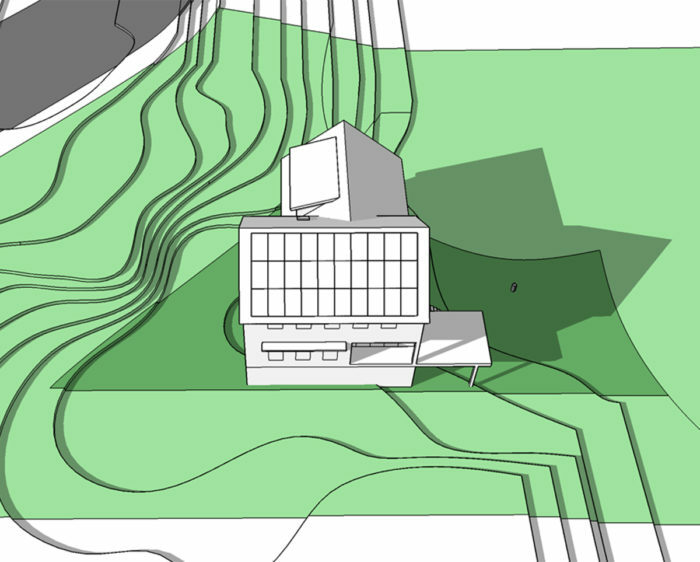 Although that is the main view from the street and it would block a lot of the house from view, the road curves around so the front façade would still visible from the approach. With the idea of designing the house to fit on many lots, the garage-to-the-side-of-the-house would not raise any eyebrows (though it may risk inducing eyelids to droop). The advantages were that the garage foundation could be minimized; the house would have a walk-out basement anyway, so exposing more of it by pushing the house to the east would not have a big impact. We could still have a combined main entry/mudroom/garage entry (something I’ll write about in a future post) and a garage bonus room connected to the main house, without needing to take up real estate with a separate stairway in the garage. 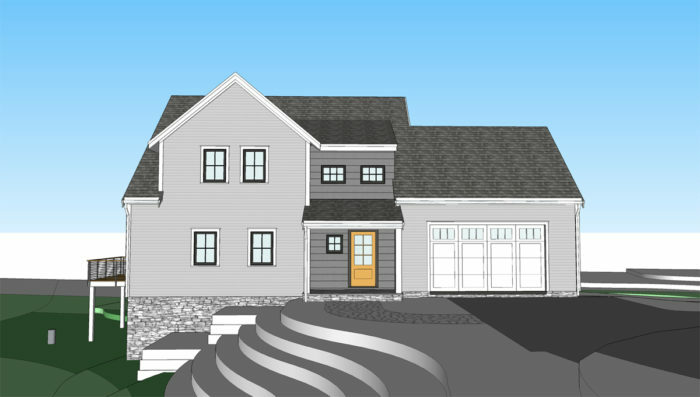 To keep the front of the house looking as classy as possible, we would keep the garage doors on the west gable, presenting a nicely balanced entry façade on the north side of the house. With the garage moved to the west of the house, the house has a sleek yet traditional look. The floor plan and exterior look were all coming together, hitting all the things we had talked about being important, then…. We learned that the garage doors could not be on the west gable. Mike Guertin had bought the lot with a septic plan already in place, connected to the engineer would had designed the system, and for various reasons there was no way we were going to change the plan, which included a septic pump station right at the corner of one of the garage doors, and the leach field right where a turn-around should be located. We pushed and nudged and tried to make it work, but in the end we ran out of options and accepted the fact that the garage doors could not go on the gable end. 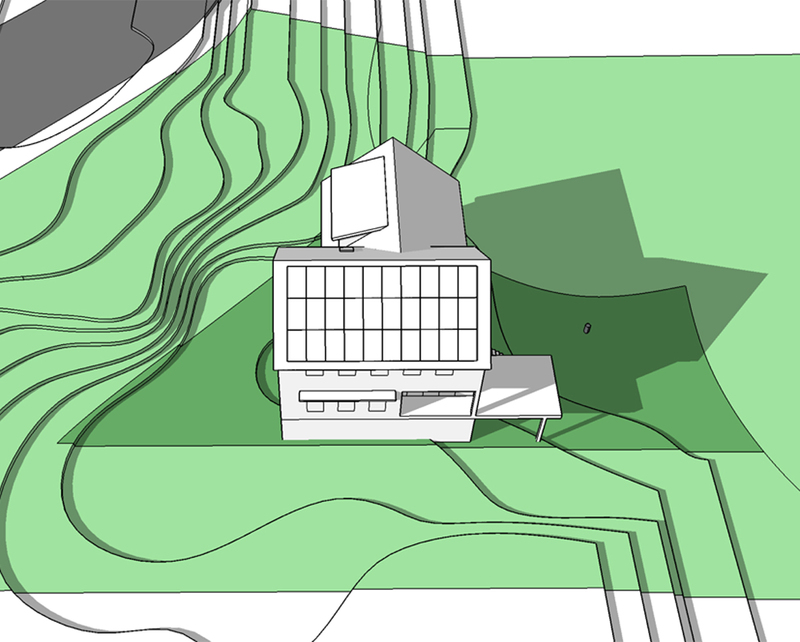 So we moved them to the north façade, the primary elevation. 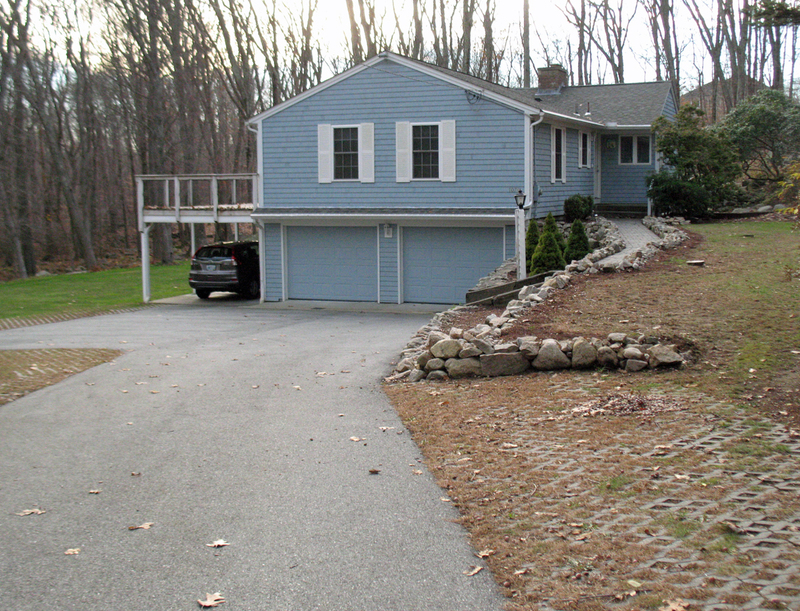 The single large garage door facing west was not possible due to the existing septic design. 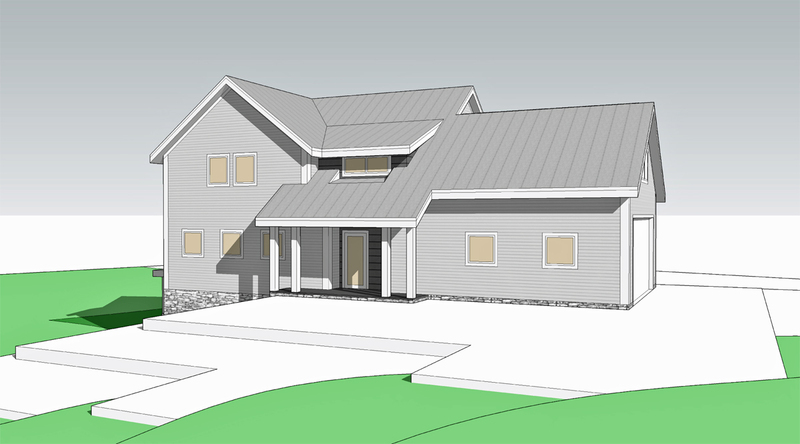 With the garage doors moved to the front of the house, facing north, we could move forward with a reasonable design. We adjusted the heights of the roofs, heights and widths of the garage doors, tried transoms and no transoms, simple and elaborate door designs, until we found the combination we thought was most attractive. Unfortunately, due to the sloping site, the angle from which you would see the house upon entry would highlight the garage, but that drove us to put extra attention into the entry to make it inviting. The long “tail” of the garage suggested a tall, vertical element at the other end of the house for balance. Finally, we had our design! Except…. Scope creep is something I talk about with every client, usually as part of the phrase “dreaded scope creep,” and something to be avoided. Starting out, we weren’t even sure we needed a garage, and now it was one of the most prominent parts of the design, while other aspects of the design had grown as well. To compensate for both factors, the garage needed to either shrink or go away. When designing every iteration of the project I had kept in mind that the garage may be eliminated at some point, so every iteration worked without a garage. On the scheme we decided on, without the garage, I would place small, square windows marching on an angle up the stairs, which would flood the stairwell with afternoon light. It would work, but… by that time, the team had become attached to the idea of a garage, and aesthetically, without the garage, the house would seem “pinched.” It would be perfect on a tighter lot, but on our site the building elements as designed would be too close together without the garage to balance the visual weight of the house. So we decided to keep the garage. The next discussion was how small to make the garage. Although vehicles are usually 5-6 feet wide, garage bays are typically 12’, wide with even more space sometimes allotted. With a 14’ door and an 18’ garage width, two smaller cars could potentially fit. A more likely scenario would be one car and the various accoutrements of suburban life filling the rest of the space. The two-car garage was changed to an oversize one-car garage, leaving a balanced facade. Reducing the width of the garage balanced the design of the façade even better than the two-car garage, although the wider overhead door is still more dominant than ideal for the front of the house. Keeping the doors simple, painted the same color as the body of the house, with the vertical band of contrasting siding at the center of the house meant, in part, to balance the size of the east and west parts of the north façade.